13:00 hrs.- Assemble at the Delhi Safdurjung Railway Station. Traditional Welcome and check - in to your respective coaches. 14:30 hrs.- Departure of the train for Gaya. Evening Tea & Dinner served on-board. Over night stay on-board. Arrive at Gaya Railway Station in the morning. Wash & change, followed by the breakfast on train. Disembark and assemble for boarding the coaches for sightseeing of Bodhgaya including Mahabodhi Temple & Niranjana River. Afternoon check-in and lunch at hotel .After lunch relax for some time. sightseeing of Thai Temple, Japanese Temple and Buddha Statue Evening: - Return to Hotel, dinner and overnight stay at hotel in Bodhgaya. 05:00 hrs. - Early morning tea & breakfast followed by checkout from the Hotel. Departure for Rajgir by bus (85 Kms). 10:30 hrs. - Arrival at Rajgir. Sightseeing at Rajgir of Bimbimsara Jail, Gridhakut hill, Venuvan. 12:30 hrs. - Proceed to a Restaurant in Rajgir for lunch. 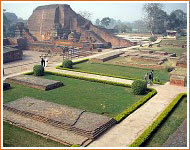 After lunch, proceed to Nalanda for sightseeing covering ruins of world famous Nalanda University & Nalanda Museum. 16:00 hrs. - Depart back to Gaya Railway Station. 20:00 hrs. - Arrival at Gaya Railway Station and board the train. Dinner on-board. Departure from Gaya at 2330 hrs to Varanasi (220 kms) by train. Overnight stay on-board. Early morning tea on-board and arrival at Varanasi. Proceed to the hotel for wash & change (room given only for wash & change) and breakfast. After breakfast, visit Sarnath (10 kms) for to see Dhamekh Stupa, Sarnath Museum, The Ashokan Pillar, Mulgandha Kuti Vihar. Afternoon - Lunch at the hotel. Followed by some free time. Tourists can either opt for shopping or other activities. Evening - Visit to the river Ganges Ghat, Evening Arti. Return to the Train. 20:00 hrs. - Arrival at the Varanasi Railway Station and board the train Dinner on board. Departure for Gorakhpur (224kms) at 23:00 hrs. Overnight stay on-board. Early morning tea on board. Arrive at Gorakhpur Railway Station. Proceed by coach to Hotel at Gorakhpur/Kushinagar. Arrive at the Hotel in Kushinagar and check-in. Breakfast at the Hotel. After breakfast, visit Mahaparinirvan Temple, Rambhar Stupa, Mata Kutir Temple etc. Afternoon - Lunch at the hotel. Followed by some free time. Tourists can either opt for shopping or other activities. Afternoon - Lunch at the Hotel. Evening participate in a chanting and meditation session. (Subject to availability of appropriate teachers/instructors). Dinner and overnight stay at Hotel. 05:00 hrs. : Early morning tea and breakfast at the hotel. 06:00 hrs. - Check-out of the Hotel and proceed to Lumbini. (Nepal) by bus. Tourists must obtain the Nepal visa from their respective countries. Otherwise, lot of time required at the border to process the visa. Arrive Lumbini and proceed to a hotel / restaurant for Lunch. Visit Lumbini including Maya Devi Temple, Ashokan Pillar and Pushkarni lake. 16:00 hrs - Departure for Gorakhpur. Arrive Gorakhpur Railway Station. Board at around 20:30 hrs and board the Train. Dinner on-board, Depart by train to Gonda at 23:30 hrs. Overnight stay on-board. Note:- Day-5 & Day-6 program may be interchanged as per the operational feasibility. In such case, Day-5 night stay would be in Lumbini & Kushinagar visit would be on Day-6. This would be communicated to the passengers before the commencement of the trip. Early morning tea on-board and arrival at Gonda Railway Station. Departure for Sravasti (65kms) by bus. Arrival at the hotel, wash & change (room given only for wash & change) and breakfast. After breakfast, visit Jetvana Vihara, Pakki Kuti & Sehat Mahet, Thai Temple. Afternoon - Lunch at the Hotel and proceed to back to Gonda railway station to board the train. 17:00 hrs - Arrival at the Gonda Railway Station to board the Train. Depart by train to Agra (450 kms) at 18:00 hrs. Evening Tea and dinner served on-board. Overnight stay on-board. Early morning tea, wash & fresh and breakfast on-board. After breakfast, proceed for the sight-seeing of the World famous Taj Mahal. 12:30 hrs. - Proceed to the Agra Railway Station. Departure by train for New Delhi (220 kms) at 14:15 hrs. Onboard lunch and evening tea. Arrival at the Delhi Safdarjung Railway Station at approximately 18:30 hrs.